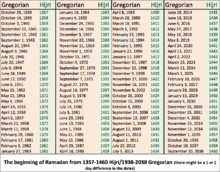 The Arabic Laylat al-Qadr, translated to English is "the night of power" or "the night of decree", is considered the holiest night of the year. This is the night in which Muslims believe the first revelation of the Quran was sent down to Muhammad stating that this night was "better than one thousand months [of proper worship]", as stated in Chapter 97:3 of the Qu'ran. Ramadan is a time of spiritual reflection, improvement and increased devotion and worship. Muslims are expected to put more effort into following the teachings of Islam. The fast (sawm) begins at dawn and ends at sunset. In addition to abstaining from eating and drinking, Muslims also increase restraint, such as abstaining from sexual relations and generally sinful speech and behavior. The act of fasting is said to redirect the heart away from worldly activities, its purpose being to cleanse the soul by freeing it from harmful impurities. Ramadan also teaches Muslims how to better practice self-discipline, self-control, sacrifice, and empathy for those who are less fortunate; thus encouraging actions of generosity and compulsory charity (zakat). Exemptions to fasting are travel, menstruation, severe illness, pregnancy, and breastfeeding. However, many Muslims with medical conditions insist on fasting to satisfy their spiritual needs, although it is not recommended by the hadith. Professionals should closely monitor such individuals who decide to persist with fasting. Those who were unable to fast still must make up the days missed later. 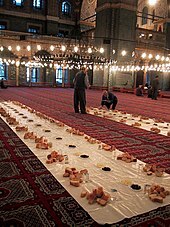 Each day, before dawn, Muslims observe a pre-fast meal called the suhur. 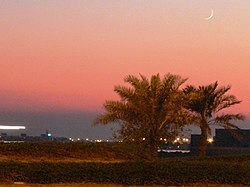 After stopping a short time before dawn, Muslims begin the first prayer of the day, Fajr. 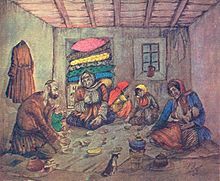 ^ Traditions, Today’s Ramadan. "Abayabuth". www.abayabuth.com. Retrieved 2018-10-30.